For the first 18 months of its existence NICRA was nothing more than a pressure group. Its main activity was writing letters to the Government, mainly to Bill Craig as Minister of Home Affairs, complaining about harassment of political and social dissidents ranging from Republicans to itinerants. But it rarely went beyond the stage of dignified written protest. The Government's reply - when it came - was usually one of denying that a particular abuse had occurred and suggesting that even if the NICRA allegation was true, there was probably a very good reason for the abuse. It was a time of frustration for NICRA. O'Neill, by polishing civic weeks to a fine art, had pushed discrimination to a high degree of sophistication. NICRA's most important advance in the period was to hold its first annual general meeting in February 1968, which produced a few new faces, but little in the way of a concerted civil rights campaign. The new faces were John McAnerney [Campaign for Social Justice], Frank Campbell [Republican], Peter Morris [no affiliation], Jim Quinn [no affiliation], Frank Gogarty [Wolfe Tone Society], and Rebecca McGlade [Republican]. They replaced Bennett, Harris, Banks, O'Brien, Dolley and Devlin. Robin Cole [Unionist] was re-elected with the highest number of votes but he later resigned from the executive. Betty Sinclair became the new chairman. But a change of executive brought little initial change to a political situation in which the Government carried on with its "not an inch" policy. October 5th in Derry at Civil Rights March. The situation would have probably continued to the present day had the decision to take the struggle to the streets not been made. Street violence was nothing new in Northern Ireland, but street politics were. Marching was something which both Orange and Republican organisations indulged in. Government Ministers often took part in the former and usually banned the latter. In April 1968, for example, the Annual Republican Easter Parade in Armagh was banned, the excuse being that a Paisley prayer meeting was planned for the same day along the route. Marches were therefore a physical manifestation of Northern Ireland politics and the recognised territorial divisions of the two sectarian groups meant that marching had become a form of sectarian one-up-man-ship. That NICRA should take to the streets was a proposal to consider seriously. It was the Government's ban on marches which forced NICRA into holding street demonstrations. After the ban on the Easter Parade in Armagh NICRA attended a Republican organised Rally Saturday after Easter [April 20] to protest against the ban on parades and a week later there was another meeting at the same spot to protest against the ban on Republican Clubs. Speakers at this meeting included Rev. Albert McElroy, leader of the Liberal Party, Eddie McAteer, leader of the Nationalist Party, and Austin Currie MP. NICRA was slowly coming to realise that a ban on street demonstrations was an effective Government weapon against political protest, and that although letter writing to Stormont was a fine form of occupational therapy, it was unlikely to bring any worthwhile results. Direct action in politics had begun. In June, members of the Brantry Republican Club and Austin Currie squatted in a house in Caledon, Co. Tyrone, which they believed had been unfairly allocated. Since there was no impartial administrative mechanism by which house allocation could be made, and since there was no method of appeal against administrative malpractice, the only course open to those wishing to object to a Government policy was direct action. In July members of the Derry Housing Action Committee continued the campaign for impartial house allocation by blocking Craigavon Bridge and 17 of them were arrested. The time for NICRA's direct action had come. 9th October, 1968. Students from Queens University Belfast hold a 3½ hour sit-down' protest against police brutality in Derry on October 5th during civil rights march. After their protest delegation was allowed to see members of the Cabinet. They presented them with the following demands: one man, one role, repeal of the Special Powers Act, the Public Order Act and the Flags and Emblems Act, the introduction of a Parliamentary Commissioner, a Human Rights Bill to be made law, the introduction of a points system for housing allocation, electoral boundaries to be re-drawn fairly, an impartial inquiry into police brutality in Derry on October 5th, and jobs to be allocated on the basis of ability. October, 1968. Group of young students from Queens University picketing the home of William Craig, the Minister of Home Affairs who banned the October 5th March in Derry and ordered the police baton charges. The first civil rights march took place from Coalisland to Dungannon on Saturday August 14, 1968. It was organised to protest against housing allocation in the area and it was supported by more than 2,000 people. NICRA's march was faced with over 1,000 supporters of an organisation known as the Protestant Volunteers, a group politically inspired by Ian Paisley and para-militarily groomed by Major Ronald Bunting. The police protected the civil rights marchers with minimum cover and denied them access to the town square. A few of the marchers were injured. Gerry Fitt and Austin Currie were present and Fitt later made a special report to the Prime Minister, Harold Wilson, in which he complained about the role of the police. The marchers sang "We shall Overcome" before they broke up. As a march the Coalisland to Dungannon journey was nothing more than another one in Northern Ireland's lengthy list of marches, but as a political event this march can be firmly marked as an historical occasion which was to shape the future political development of Northern Ireland. On the day it achieved little, but in retrospect it was the signal for the beginning of the biggest mass movement seen in Ireland this century. On Monday September 2nd NICRA announced that a march would be held in Derry at some time in the future to protest about the housing situation in the city, unemployment, local government reform and the right of free speech and assembly. The march was eventually planned for October 5th, and it came as no surprise to anyone when the Apprentice Boys of Derry gave notice of a ceremony which they intended to hold on the same day along the same route. Bill Craig banned both and NICRA decided to go ahead. October 5 in Derry witnessed the first bloodshed in the present violence in Northern Ireland. The blood was that of many of the 2,000 marchers who defied Craig's ban. It was spilled by RUC batons and among those injured was Gerry Fitt. Three other Westminster MPs, Russel Kerr, Ann Kerr and John Ryan witnessed the events. They saw the police baton the leading marchers in Duke Street and they saw that as the marchers turned to go back down the street they were ambushed by another company of police. Although only 2,000 people were present, the film of the brutality taken by an RTE cameraman flashed around the living rooms of Northern Ireland and the political upheaval feared by Unionists for fifty years had begun. Prior to the Derry march the civil rights campaign had attracted the support only of the politically conscious. It was not a mass movement in the sense that it attracted massive support. Its non-violent methods and its refusal to equate civil rights with Irish nationalism made it virtually an unknown quantity in politics. But Bill Craig's police force stamped the authenticity of NICRA as a broad movement on the heads of the people in Duke Street and on the hearts of the television public. The Government's political justification for the Duke Street police ambush was that NICRA was a subversive organisation intent on destroying the state. It was the traditional Unionist response to any attempt at democratic progress but with NICRA's demands sticking rigidly to a policy of political reform and ignoring completely the issue of the state's existence, the Stormont Government had made its first wrong move in retaining power in nearly 50 years. Nothing would ever be the same again. Almost 90 people were treated in hospital for injuries sustained at the hands of the police and the first minor riots in Derry began over the week-end. In the political field events moved fast. In Derry a Citizens Action Committee was formed with Ivan Cooper as chairman and John Hume as vice-chairman. Although the nucleus of the Derry Committee had been involved in the planning of the Derry march, much of the support for the new organisation was based on a reaction to the police violence. Elsewhere in the province local civil rights groups sprang up in solidarity with NICRA and although they gave the NICRA executive some headaches through the holding of unauthorised street activities, they were a welcome illustration of the upsurge in popular support. In Queen's Univerity the Derry violence had coincided with the relaxed atmosphere at the beginning of the first term and, shocked by what they had seen on television, many of the students joined in a spontaneous march from the University to the City Hall in protest against police brutality in Derry. The march ended with a sit-down in Linenhall Street at the back of the City Hall and the afternoon 's events gave rise to an informal organisation in the University. It was called the People's Democracy (PD). 16th November, 1968. Second Civil Rights March held in Derry City. 15,000 people attended the march which halted at the police barriers at the entrance to the Walls. Later a "token" walk through was staged by one or two members at the barriers. No incidents occurred and the entire crowd walked individually to the "Diamond" where a "sit-down" was staged. Although essentially a product of the civil rights campaign, the PD was made up of politically naive students who eventually found leadership in the politically aware personalities of Michael Farrell, Kevin Boyle, Cyril Toman and Bernadette Devlin. Although PD grew out of a genuine desire for civil rights by a broad section of the student population, its leadership aimed it in the general direction of a socialist political philosophy and away from what they regarded as reformism. In the whale's belly that was Queen's, cut off from the outside world, the students were easily led from reform to revolution in a matter of weeks and PD declined into a narrow, politically sectarian organisation united only by the politics of impatience. Initiated into politics by the need for civil rights they decided that only socialism could provide such rights and immediately demanded socialism. Like the Nationalist Party they confused the demand for civil rights in the existing state with a demand for a specific form of government which only the abolition of the state could provide. But in the political atmosphere in the autumn of 1968 the umbrella demand was civil rights. Several groups sprang up throughout the country and the support for NICRA's campaign was expressed at another march in Derry on November 16. The RUC's use of batons against the 2,000 in October produced a massive turn-out of 20,000 in November, especially in view of Craig's banning the march. 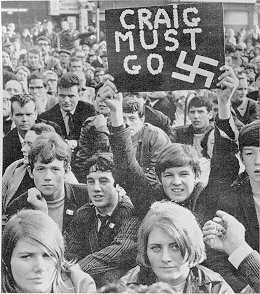 A new demand was now chanted at civil rights marches: "Craig Out". peace as a result of the Civil Rights March of October 5th. The Unionist Government was in retreat. O'Neill was in trouble on several fronts. Inside the Cabinet there was opposition to Craig's heavy handed tactics in dealing with the first Derry march, an opposition not based on humanitarian grounds, but founded rather on the adverse publicity which the incidents received. O'Neill was also in trouble with the extreme right wing of his own party in Stormont, which was expressed on the streets in the form of Paisley and his mobs. Relations between the Catholic community and O'Neill were also in decline and the RUC had destroyed in ten minutes what years of civic weeks had built up. But the most important front on which O'Neill was in difficulties was in his relations with Westminster. The Campaign for Democracy in Ulster had prepared the groundwork for concern about civil rights in Northern Ireland and the cut on Gerry Fitt's head brought the issue into the House of Commons. Westminster was concerned that peace was not being maintained and on November 4, Prime Minister Harold Wilson summoned O'Neill to London. With O'Neill went Craig and Faulkner - Craig because he was the Minister for Home Affairs, Faulkner because he was the brightest boy in O'Neill's Stormont class. As Wilson later said in the Commons he thought that political reform in Northern Ireland had been "a bit too moderate so far", but in a five point plan of reform sent to O'Neill on November 21, Wilson proved that he too was moderate on the issue. The "reforms" included the abolition of the company vote in local government elections, the appointment of an Ombudsman at some future date, re-organisation of local government by 1971, a recommendation -nothing stronger - to local authorities to reform their housing allocation procedures and the establishment of a commission to run Derry in place of the Corporation. It was an empty gesture by Wilson. Derry had gone from "One Man, One Vote" to "One Man, No Vote" with the abolition of the Corporation, the Ombudsman might never come and although the company vote had been abolished, the property qualification had not. One man could still have more than one vote. Wilson's concern for Civil rights proved as strong as that of O'Neill. Meanwhile back on the streets NICRA continued to march. Despite a take-over of Armagh city centre by Paisley and his followers in the early hours of November 30, a civil rights march planned for the city that day went ahead. Its route was blocked and a meeting was held at the RUC barrier. A lawful march had been halted by an illegal meeting and the RUC - the para-military arm of the Unionist Government - was either unwilling or unable to do anything about it. Things were rapidly coming to a head in politics. Craig had become isolated in the Cabinet. In December he said "When you have a Roman Catholic majority, you have a lesser standard of democracy", and O'Neill effectively decided to remove him from office. Before doing so he made his famous "Ulster at the Crossroads" speech on television on December 9. Armed with an upswing in public support he had the confidence to sack Craig two days later. There were two reactions to the speech and the sacking. The PD decided to form a number of extra-mural branches as soon as the reforms were announced and the following day, for example, they held a meeting in Dungannon to gloat at Craig's sacking. The reaction of NICRA was much different. They decided to give O'Neill one last chance and they declared a "truce" for one month without marches or demonstrations. in the "Diamond" Derry on a civil rights demonstration. the chances of sectarian violence were growing by the day and anything which might defuse the situation would be welcome. The year ended peacefully. In the period from August to December the civil rights campaign had managed to split the Unionist cabinet, arouse concern at British cabinet level, bring thousands of people demanding civil rights on to the streets and produce a general public awareness of the lack of democracy and a political programme for its introduction. On the negative side it had aroused extreme Protestant reaction as a result not only of the marches but also of the Government's political reactions and it had given rise to an impatient group of students seeking instant revolution in a text book society. In the light of the influence of the organisation since its beginnings, this four month period put NICRA in the vanguard of the struggle for civil and human rights in N. Ireland. But there was still a long way to go. November, 1968. Connolly Association demonstration in London Hyde Park to protest about lack of civil rights in Northern Ireland. In the background can be seen the banner of a powerful trade union: the Draughtsmen's & Allied Technicians' Association (DATA).